Lat: 43.4° N Lon: 70.72° W Elev: 243 ft.
Cloudy. A chance of showers this evening, then a chance of showers with areas of drizzle after midnight. Areas of fog after midnight. Lows in the lower 40s. South winds around 10 mph. Chance of rain 50 percent. Mostly cloudy. Areas of drizzle in the morning. Areas of fog in the morning. Warmer with highs in the upper 60s. Southwest winds 10 to 15 mph with gusts up to 30 mph. Cloudy. A chance of showers in the evening, then showers likely after midnight. Lows in the upper 50s. South winds 10 to 15 mph. Gusts up to 30 mph in the evening. Chance of rain 70 percent. Patchy fog in the morning. Rain. Highs in the mid 60s. South winds around 10 mph with gusts up to 20 mph. Chance of rain 80 percent. Rain. Patchy fog. Lows in the lower 50s. 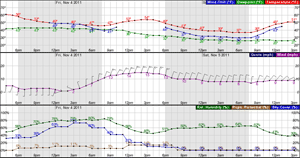 South winds around 10 mph in the evening, becoming light and variable. Chance of rain 80 percent. Patchy fog in the morning. Rain likely, mainly in the morning. Highs in the lower 60s. Chance of rain 60 percent. 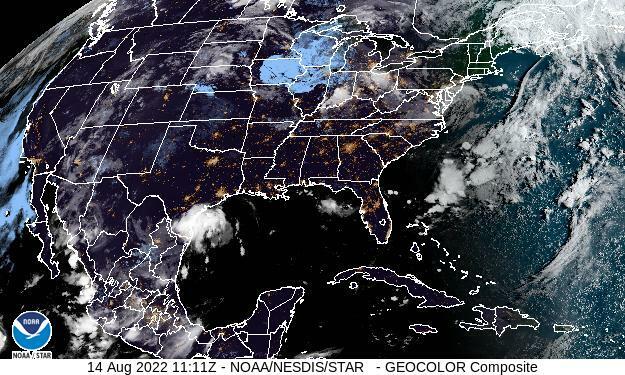 Mostly cloudy with a 30 percent chance of showers. Lows in the upper 30s.